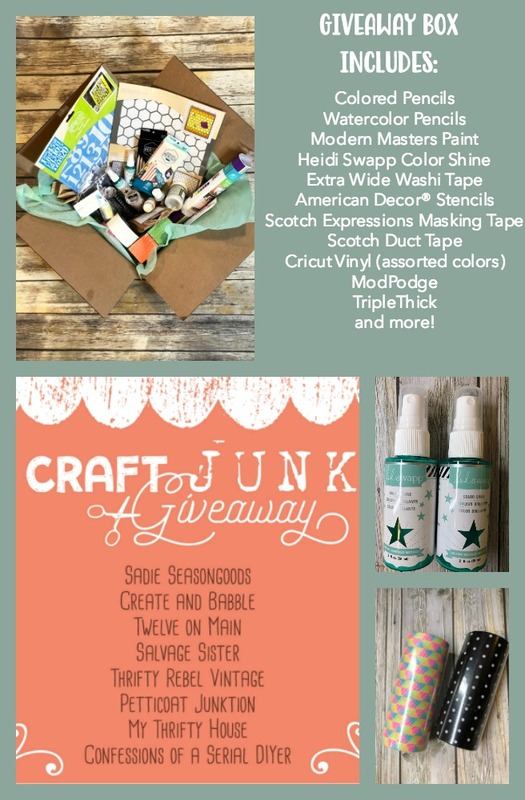 If you’re anything like me you could always use some cool crafting junk, and since my stashes are always overflowing I’m so happy to be taking part in these quarterly craft junk/supply giveaways. It means some cool stuff for one of you, and for me it means more room in my craft studio for more cool junk. So that’s a big win win! 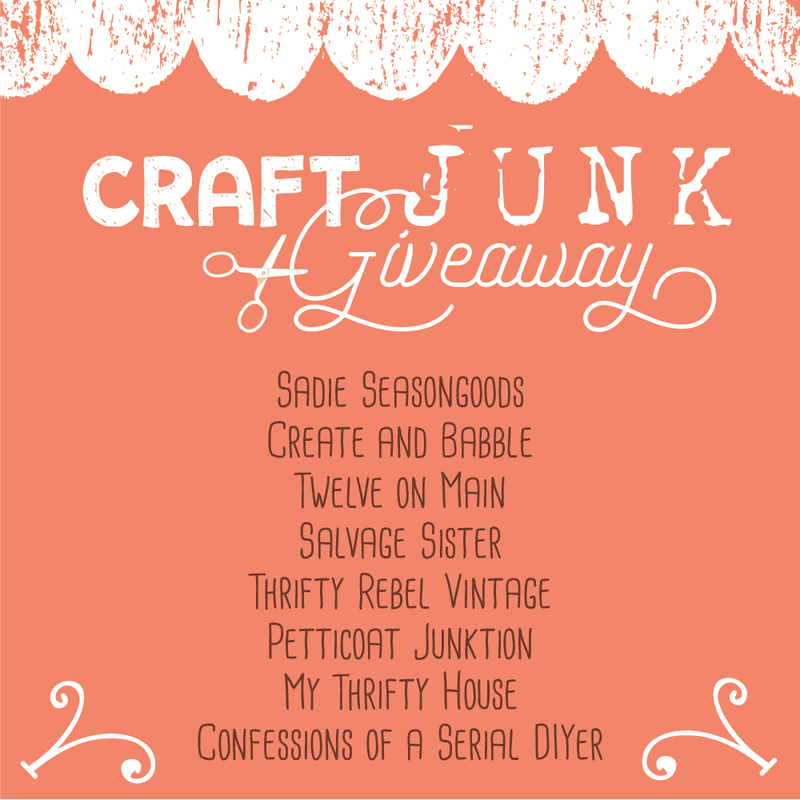 I’m thrilled to be joining up with 7 other fabulous bloggers for this Craft Junk Supply Giveaway. Yay! 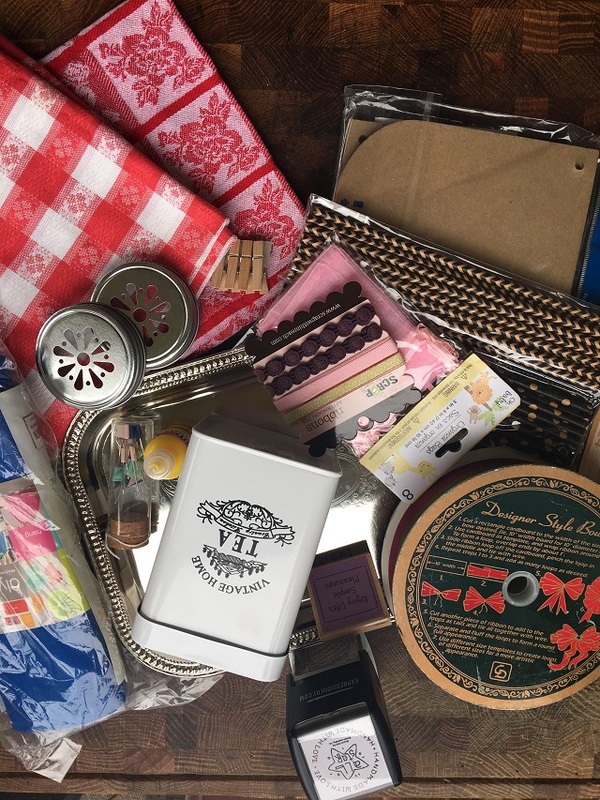 We’re all dipping into our stashes to fill our boxes with amazing crafting/repurposing supply goodness, and each of us is hosting a separate giveaway. That’s 8 fabulous giveaways that you have a chance to win! Getting your chance to win is super easy. All you have to do is enter through Rafflecopter further down in this post, and don’t forget to visit the other 7 bloggers to enter their giveaways too. This giveaway ends on Sunday, April 15th at 6 am EST. Now here’s what my giveaway includes. Mine is a mixture of a lot of cool stuff, and it’s all waiting for a new home. 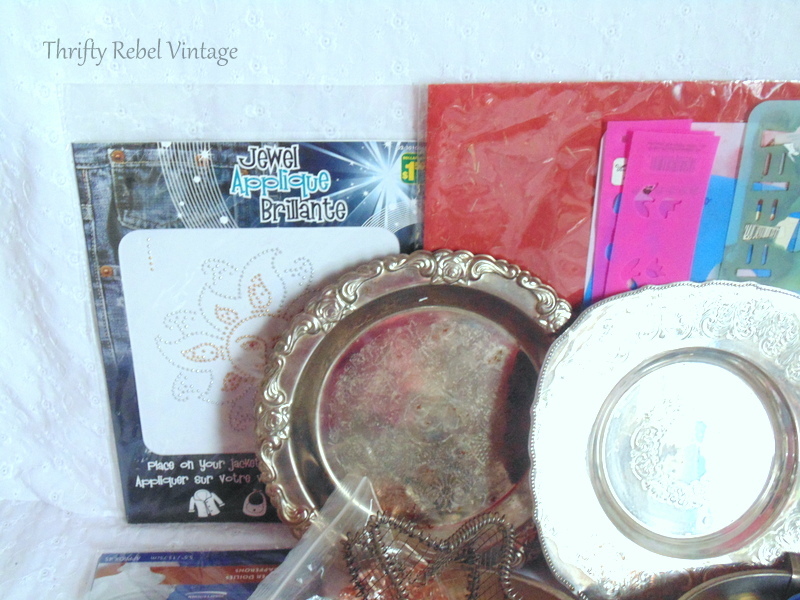 A sun jewel applique, some red decorating crafting paper, two silver plate dishes. 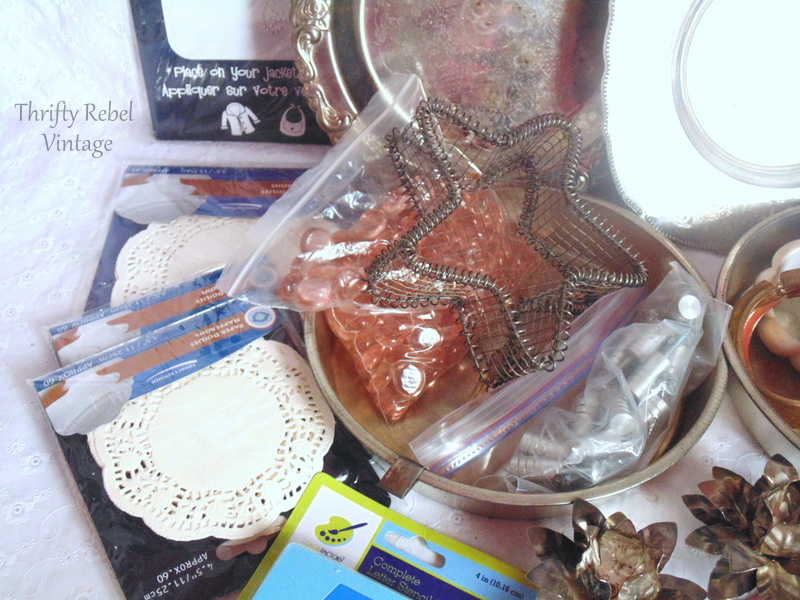 Some small paper doilies, peachy/pinky glass beads, a silver metal star thingy, some silver drawer pulls/knobs. 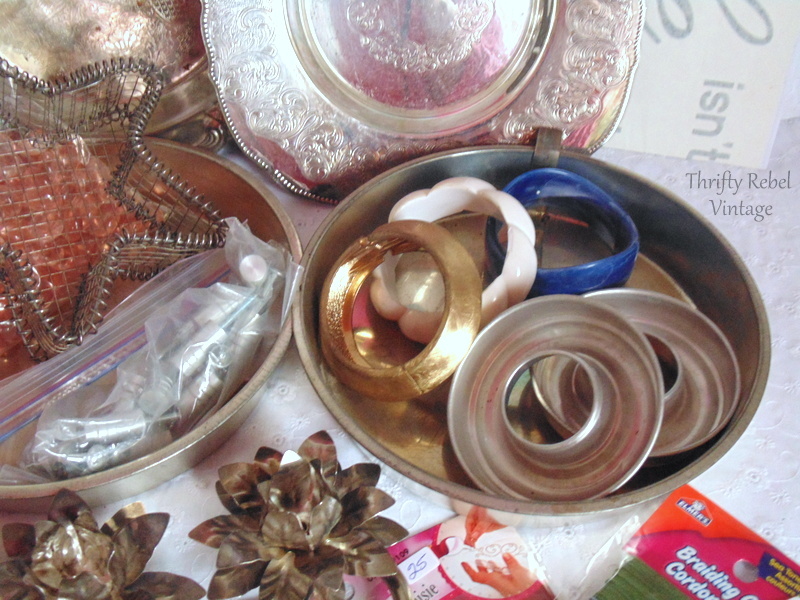 Two metal cake pans, 3 plastic bracelets, two wreath-like jello molds. 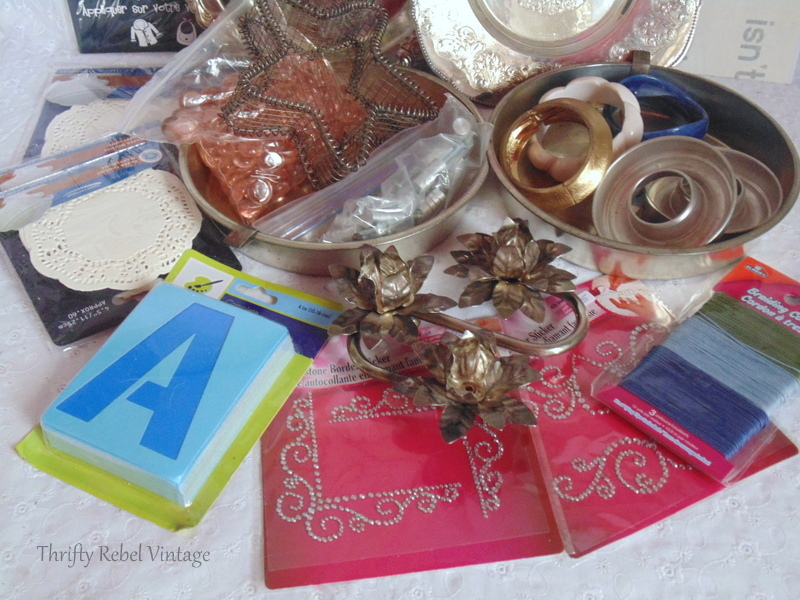 Large letter stencils, faux rhinestone appliques, a silver roses candle holder, and some braiding cord. 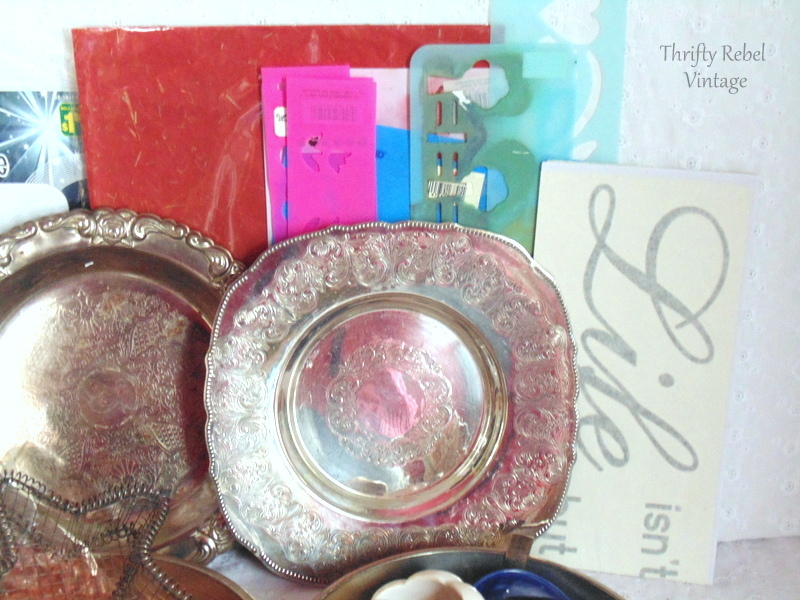 And I love to tuck in a few surprises when I see how much more crafty goodness I can fit in once the box it’s packed up. I really do squeeze in as much as I can. So enter away! And share this giveaway with your friends so they can enter too! Now be sure to visit the other 7 bloggers and enter their awesome giveaways too! Great junk! Thanks for the giveaway! Thank you for the fun opportunity to win! Love your blog. So many good ideas. 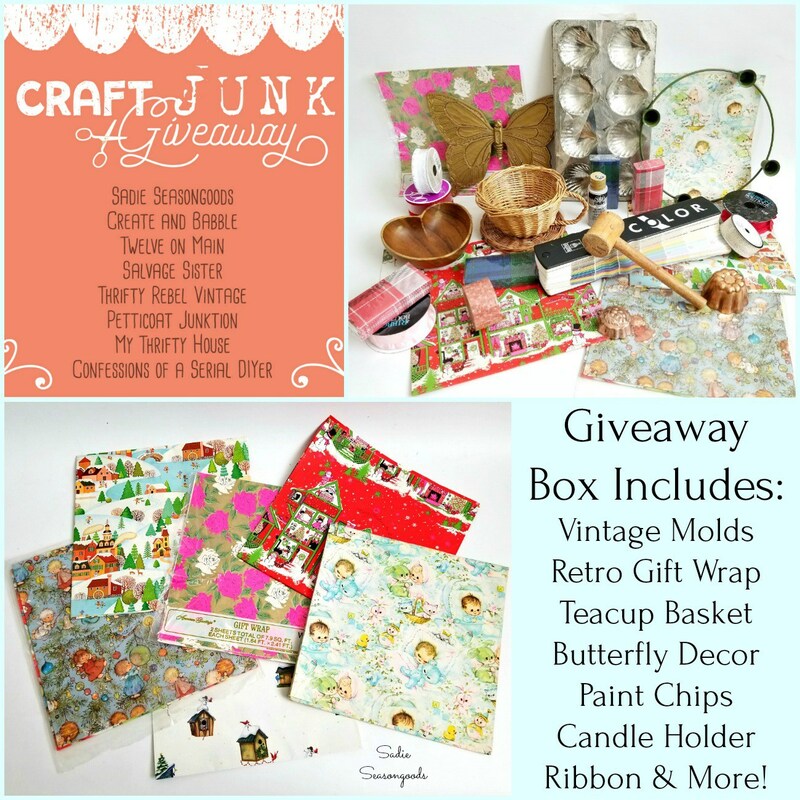 Thanks for the chance to win these craft supplies. Thank You for a chance at such a gorgeous box of goodies. Just love turning something old into something new. Great ideas you have. Thanks. Love all that crafty goodness!!!! This is such a fun giveaway. Thanks for hosting. Love to see all the goodies everyone packs in their boxes. So many wonderful goodies ! thank you for the chance to win ! Amazing goodies! Thanks for the chance. So cool! Great way to share your stuff! Awesome giveaway, Thank you. One mans Junk is another mans treasure. 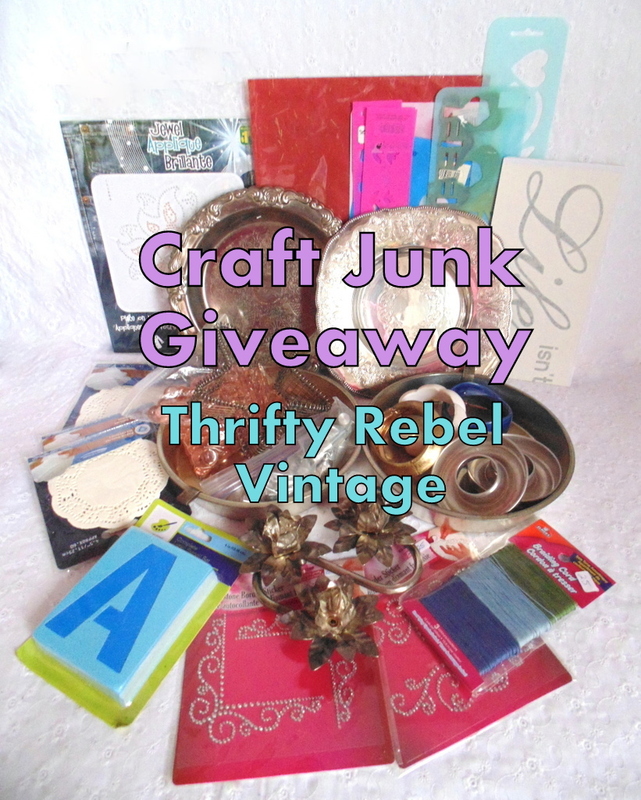 I love to see all the treasures included in these giveaways! Lots of nice junk we could use to repurpose into something wonderful! Awesome goodies! Thanks for the giveaway! Lots of awesomeness in this prize package! Thanks for the chance to win it! I can’t wait to be the one to open all those goodies. Lots of fun stuff! Thanks for the chance to win. Thanks for the give away. Love junk! Wonderful selection of goodies! I sure hope I win! SO COOL TUULA! Thanks for another opportunity to win fabulous supplies. Awesome contest… great way for us all to get more ideas. I am looking forward to following you. What fun.. is like Chrismas in April! Thanks for the giveaway, Tuula! I want to win! So many great items to create with. Thank you for the chance to win. Wow…lots of kewl stuff! Thank you for the giveaway! 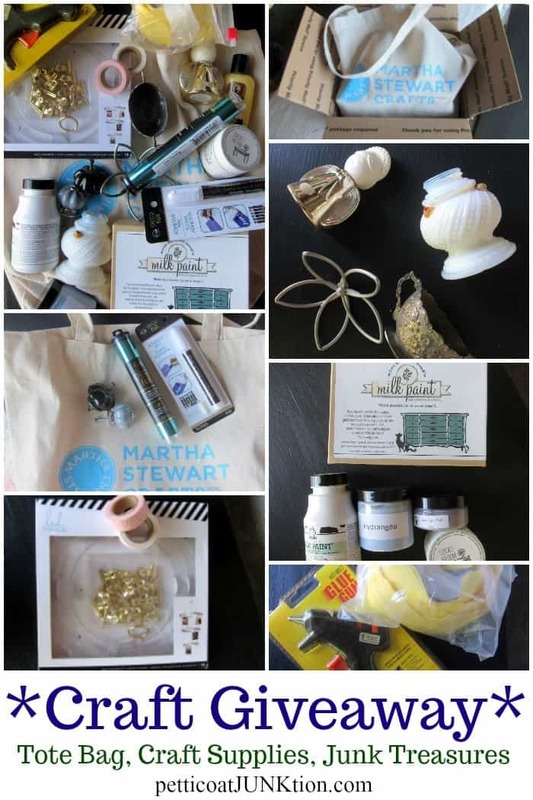 So much fun to open a surprise package and try some of the leftovers from great crafters. So many goodies ! !Thanks for the giveaway…. I love your ideas! Thanks for giving us a chance to win some crafting goodies. Such a fun giveaway! Love when y’all have this! Very excited about this giveaway! Thanks for the chance to win! Very excited about the giveaway. So many goodies! Thank you for the chance to win! Oh, my! Just what’s needed to get creative juices flowing! I totally love the star metal thingy. Great find! Excited that its in the give-away. Fingers crossed. Wow, what a mish-mash of treasures! Thanks!!! 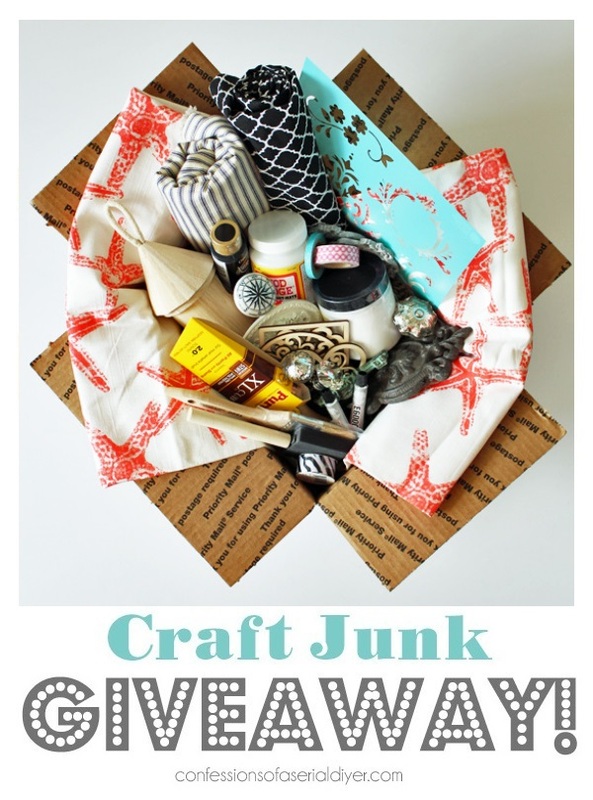 So many fun items in your box…I’d love locking myself up in my craft room to play with it all! Thank you for the lovely giveaway! Vintage is my passion! Love this! Thanks for the fun giveaway! 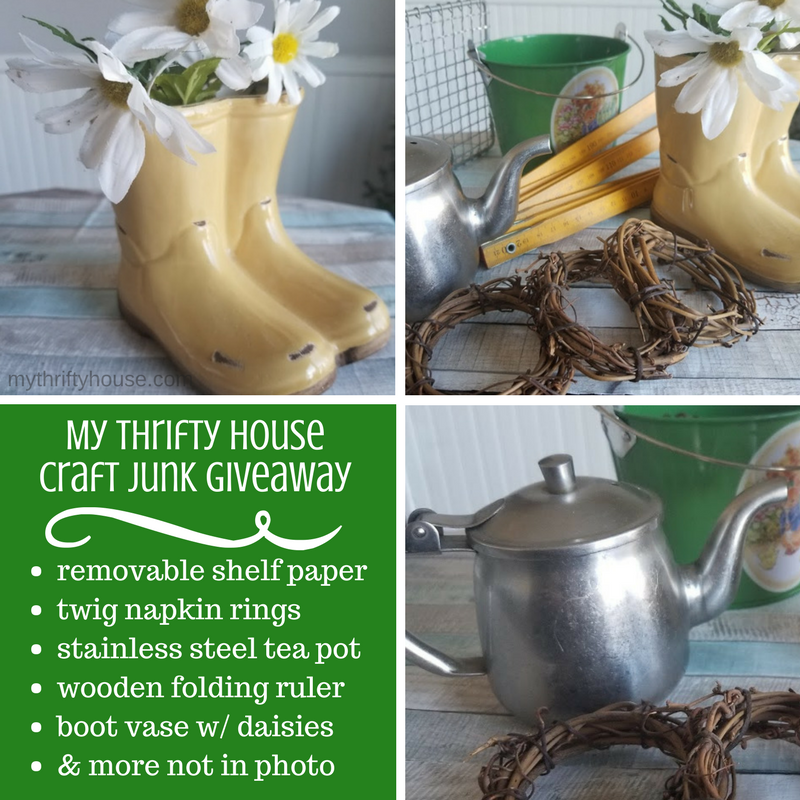 Love to have such great items to craft with thanks for the giveaway. I’m so glad I now follow you! Thanks for the chance to win something!??? Love all of your fabulous project ideas! You always amaze me with your wonderfully clever ideas! Thanks for so much inspiration! What a great bunch of giveaways and some new blogs to follow! What a fun giveaway, thank you for the opportunity to enter! Have a great day! So much fun! 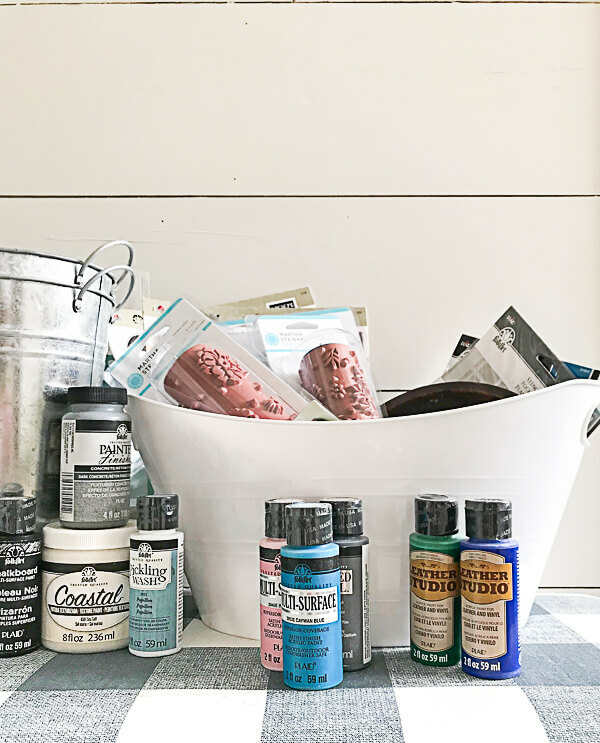 I always love adding new supplies to my craft box! Thank You for this generous giveaway. Everything is terrific. I love your idea and I really hope I win. Then I can practice your examples. Good luck to all of us. I love your idea and I really hope I win. You are so creative. Good luck to everybody. I love getting craft goodies free it always give me new inspiration. What a fun and awesome prize pack! Thanks for the chance! I would make use of everything in that prize pack, thanks for the giveaway! Love it all, thanks for chance.